Why would you need to do any phone jack wiring? I can remember a few years ago calling a new phone order in to the phone company. The customer service person, explained to me the various charges. Then she outlined the extra charges for anything that would need to be done inside the home beyond the junction box. All I can remember was the $45 for the first fifteen minutes and $25 for each fifteen minute period after that. I had already pre-wired the house, but that certainly scared me. I went back and checked all the wiring to make sure I did not need anything done inside the house. How hard could it be to warrant $120 per hour, and that was several years ago. Phone jack wiring is not that difficult. The only complexity is that we now have more options. Wireless phones, internet phones and of course the old stand by, wired phone jacks. Check out the information below to see if you are up to this type of repair. Look at the evaluation section first to determine if it is worth it. Did you call the phone company? You could save a lot. Assuming you called someone that had rates that would be somewhere on this planet, you could be looking at $50 to $75 for someone to come out. Could be more, fishing new wires for phones into an existing home can be time consuming. Phone jack wiring is not that hard. The difficulty comes with getting the wires to where you want them. We are excluding installing new phone wires in your home, for this article. Loose wires are the obvious simple solution. Check the connections. Does something change when you jiggle the wire? Yes, it could be that simple. Connections are very sensitive. Make sure you are getting a good connection at all critical locations before you mess with anything else. Well, being without a phone is a definite problem. This is low voltage wiring so there is not a lot of danger. The older your home the better chance you have of finding different types of phone wiring. For home built in the last ten years the wiring is supposed to meet Cat 3 Standards. Cat 5 wire now being the preferred wire. The advantage to this type of wire is that it eliminates 'cross talking' (hearing another conversation over your line) and interference from radio frequencies. Homes that are older than that might have the 'quad' wiring that was used for several decades. This wire had four conductors, not twisted as the new standard requires, they were red, green, yellow and black. Phone jacks and other phone devices that you purchased would be color coded to match this wire. 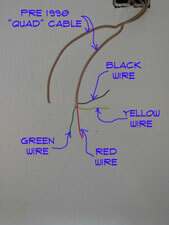 The red and green wires would be the primary line and a second line could be hooked to the yellow and black wires. In theory this would work fine. The problem is that they are not twisted pairs and are susceptible to the 'cross talking' and interference previously mentioned. This type of wire may be fine for a single line or could even accommodate a fax line. You may get the fax noise bleeding into the voice line if you use it this way. If you are planning on a home office or multiple hard wired lines for whatever reason, you will want to upgrade the wiring. Cat 5 Wire comes with four twisted pairs. The colors are Blue/White with Blue stripe (Primary Line); Orange/White with Orange stripe (Second Line); Green/White with Green stripe (Third Line); Brown/White with Brown stripe (Fourth Line). That is how the colors are supposed to be used. That does not always mean that they were used that way in your home. 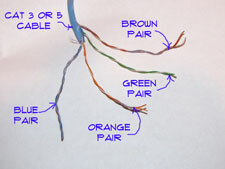 Twisted pair wires should not be mixed with each other. Back to that whole 'cross talk' thing. Instead always use the pairs together as they come in the cable. One pair, one line, simple, right? You may run into other types of wire in older homes. When possible you may want to replace older or non standard types of wire. The newer wire is designed for communications and does a much better job. There are different types of telephone service that you may encounter in your home. The type of service affects the wiring that you will have. Analog - Standard land lines or analog lines are the kind we had for decades. The phone company brings one or more lines into your home via a terminal block. This block is usually located on the outside of your home. Your internal phone wires are hooked to it and the phones work. This type of wiring has its own power in it. That is how you are able to hear the dial tone. Most new phones with features require more power and have 120 volt adapters attached to them. DSL - Stands for Digital Subscriber Line. Without getting into tech talk this technology gives you high speed internet over a standard analog phone line. How fast and in which direction it is provided will be determined by the service your phone company provides. In practice, you often get a voice line and a DSL line in one package. 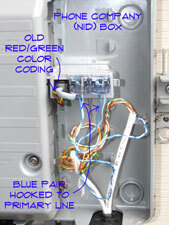 DSL lines are hard wired into your home and use wired jacks similar to the hook up the phones. There is usually a splitter that allows you to separate the phone line from the digital service for the computer. Wireless - You are still able to have wireless phones in your home if you purchase a set up that uses a base unit. The base unit is hooked to the hard wired phone line and transmits to the other wireless phones. This allows you to put phones anywhere in the home. You can purchase a pretty decent system with three or four phones for less than a hundred dollars. 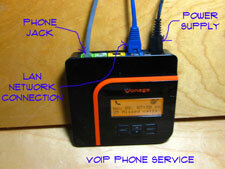 VoIP - Stands for Voice over Internet Protocol. This allows you to have a telephone that works via a high speed internet connection, usually a cable modem. The advantage to these systems is a lower cost. An adapter is hooked up the modem and usually provides a phone jack. You will need to disconnect the phone company's wiring from any line that is being hooked to the hard wiring in your home. You can burn up the adapter if you do not. The intricacies of mixing a VoIP system with various other types of phones in your home is beyond the scope of this article. You may get a self explanatory kit from your provider that tells you exactly how to hook it up. Follow the instructions carefully, call the tech line if needed. Take a look at this webpage for some additional information, How to Distribute VoIP Throughout a Home. This website provides a pretty in depth discussion on what to do for this type of system. Cell Phones - Many people have scrapped the idea of having a home phone number altogether. They just use their cell phones for all of their calling needs. Nothing wrong with this, just remember to plug it in. You don't need any phone jack wiring at all for a cell phone connection. The whole concept of phone jack wiring is pretty simple if you stay with the pairs. How many lines do you have coming into your home? For each line you should have a pair of wires that is coming out of your terminal box or Network Interface Device (NID) in phone company speak. Often the phone company will mark the lines with the number that is associated to them. This would normally be true where you have multiple lines. With only one line it should be a no brainer. The first thing you want to do is determine which pairs are associated with which lines in your home. The phone company will likely use the normal hook ups. Using red/green; or blue/white for the primary line. Write down which pairs go to which lines. Most over the counter phone jacks and devices will still use the red/green colors for the primary line. So if you are hooking up a fax line to a jack you will attach the orange/white pair to the red/green terminals on the jack. Is the jack for the regular phone line? You would hook the red/green or blue/white wires to the red/green terminals. Simple? So is rocket science to an MIT graduate. Just keep the pairs together, don't mix them up. If you get them backwards you can usually tell. Try the primary line, does the fax machine screech in your ear? Does your daughter answer on her line? You have something reversed. Switch the wires and try again. Test all the lines before you get everything put back together. Are all the phone jacks working now? Good, this phone jack wiring project is history. 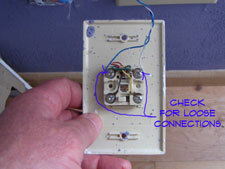 Troubleshooting phone jacks will often involve loose or broken wires. Assuming your phone service is working at other jacks in the home you would want to check the connections. You saw how thin that wire is, yes it can break. Take the cover plate off and check the wires. Are they loose? Do they appear to be broken? Try redoing the connections, possibly cutting a little off of the wire and stripping them again. A break is likely to occur right at the connection lug. Hook them back up and see if the phone jack works. Phone jack wiring will usually be connected together on the back of each jack. Check other nearby jacks to see if there are any loose or broken wires that could be feeding the problem jack. Unless you have been doing some remodeling, it is unlikely that the wire in the wall had gotten damaged. Not impossible, just unlikely. Are all your jacks working now? Great, you have successfully dealt with some phone jack wiring issues. How to you feel? I thought so, proud. As technology continues to advance there will no doubt be more and more ways that phones can be hooked up. Today there are still a lot of phones that are hooked to hard wires. It is low voltage wire and can break. Remember that each phone line needs a pair of wires to work. Keep the pairs together. Locate the right pair for the phone jack you are working on, two minutes with a screwdriver and presto, a working phone line. 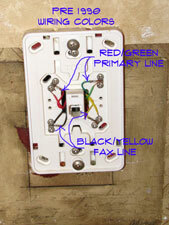 Phone jack wiring can be that simple.